Look anywhere and you’ll hear someone telling you that you need to be using social media for your small business. For our purposes we’ll be talking about Facebook but you cannot ignore Twitter or Linkedin as other avenues for networking. Working with Facebook doesn’t come free, okay it does monetarily but you need to devote some time to it for it to be worth your while and gain a following. Like anything, if you aren’t committed to the process you aren’t going to see the fruits. What you are doing is reaching into people’s bedrooms, offices, living rooms and traditional methods of interaction typically don’t apply. If you’ve used Facebook for any length of time you no doubt have friends that use it in a variety of ways. Some like to use it as their own personal sounding board and podium effectively delivering a daily monologue. Some like to share the intimate minutiae of their lives. And then there’s the middle ground where people like to have some interactions on a wide range of topics. I personally recommend the latter as your small business model. You’re opening up a discussion not blindly throwing advertising at your audience. The more personal the more chance of actual interaction you’ll have. I’m totally guilty of using the FiscalGeek Fan page of just blindly linking to my next post and I aim to be more conversational from here on out. Fan Page or Separate Business Identity? You have to make a choice, you can either create a fan page for your Business or you can just orient your identity in Facebook to your business so any interaction with you is Business related. I like the fan page especially if you have a large group of friends you can recommend they be a fan of your business but if you are starting with your own identity they have to actively friend you. It could happen but I’ll think you’ll have an easier go of it with a fan page. I also recommend you spend some time on Facebook if you haven’t already just getting used to it and finding some long lost friends and family. That way when you launch your Fan Page you’ll have a built in audience and you’ll have a better idea of the things that your friends and family might be interested in. If you have more than 25 fans of your Page you can go and create a custom URL just like you can for your own username. 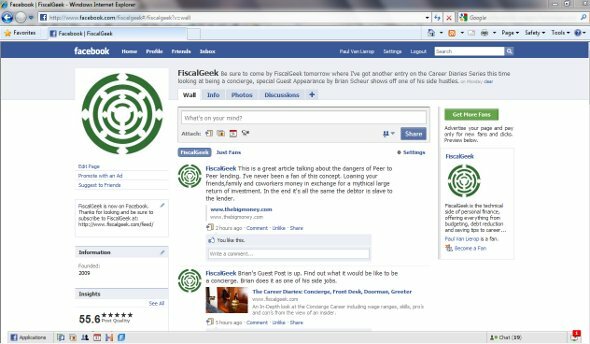 So if you go to http://www.facebook.com/fiscalgeek you’ve hit my fan page. Be sure and sign up to be a fan while you are there! This will give you a much easier and more desirable URL to hand out and put on your business cards. Just go to Facebook’s login at http://www.facebook.com/username to make the change. Be careful, if you haven’t set your username already you might want to do that first, and then choose your fan page in the drop down. How Do I See Notifications for My Fan Page? In casual Facebooking you pretty much see and are notified about everything. What you don’t get any notification of is comments on your Fan Page wall. It’s definitely a shortcoming but there are hacks to work around the issue. And I highly suggest you implement these hacks. You don’t want your fan base thinking that you ignore them when they ask a question or provide a comment on one of your previous posts. So what’s a person to do? Yeah it seems a little brash to be “liking” all of your posts but once you do whenever someone comments on that post you’ll get a notification. You have told Facebook that you “like” this post so I want to subscribe to any updates to it from you or anyone. That really is the point of ‘liking” something it’s not to say, yes I’m voting for this topic, it’s a way to subscribe to the comments without actually providing one yourself. If you use the Firefox Browser you can install Update Scanner and set it to watch your Fan Page. That way when anything changes you can know about it. Your mileage may vary with this one and I’ve had mixed results myself but at least you aren’t having to like everything you write. If you are a blogger or similar profession and have a variety of updates you want to blast out to the various social media sites it might be tempting to link your Facebook and Twitter streams together so you only have to update in one place. Let me caution you about that idea for several reasons. Twitter and Facebook are not the same thing and the audiences are different. They also have different mechanisms for filtering updates and things you see. Because of that you’re rapid fire 140 character twitter updates showing up in everyone’s Facebook News Feed can quickly become annoying. In Twitter it’s what you expect, but in Facebook the slightly more interactive nature of the environment makes your monologue tweets seem impersonal. To top it off they may not use Twitter at all so when you are throwing around #hashtags and RT’s they’re going to think something is wrong with you. Take the time to link to your own posts and pages in Facebook and add a slightly more personal touch to them with a comment. It takes a little more time, but I know as an avid Facebook user I’m much more likely to go take a look. If you are a blogger the Holy Grail of stats is your RSS subscribers. But I would challenge that statistic. You might have a collection of friends and relatives who don’t use RSS at all, give them another opportunity via your Fan Page. So be sure to add a badge to your site so it’s easy to find you. But be careful there are several types and not all are created equal. I recommend you use a badge and not a Fan Box. A Fan Box let’s you show who your friends are and your stream but the disadvantage is that it makes many remote calls to Facebook when your web page loads. Sometimes it can slow down your site and do you think your fans really want you showing their profile pic’s on your website? So go for the badge which is just some more generic HTML. Go to http://www.facebook.com/facebook-widgets/pagebadges.php and you can customize the HTML to show on your site. Got any of your Own Tips? Are you an active Facebook user and got some tips you want to share with the rest of us? Love to hear it. Great article! I particularly liked your ideas for a work around for receiving notifications of any comments from fans on your fan page. Paul, what would be the advantage of having a fan page as opposed to an entirely seperate facebook account/page for your business or website? I think the biggest advantage of the fan page is that’s how people are used to interacting with business and things they like. It’s generally assumed that your overall facebook account is of a personal nature. Most of the successful engagements I have seen are through the fan page. I’ll be honest though neither are ideally suited for small business, and why I wrote this post to help get around some of the issues. You can really do either but for me I’ve chosen the fan page route. Facebook is something I’m still getting my head around! I interact better with Twitter but I think it’s worth looking into my facebook page and how to better use it. Thanks for the tips. You got it, hope they are helpful. I’ve been using Facebook for quite awhile, longer than Twitter, although semi recently for FiscalGeek. I think the most important thing to remember is that they are not the same, and people expect different interaction from one to the other. Great post, Paul. As someone who has linked my Twitter and FB accounts, it has its downside. For me, it worked really well when I was crossing the country on a bike and wanted to send one update that would hit everyone when time was at a premium. Now, that’s no longer the case and I have already encountered moments when I didn’t really want the tweet to feed to FB. Good stuff to be thinking about for whatever I start up next. Great post Paul. I didn’t realize until reading this post that you can give your facebook page a username. Mine didn’t have one, but now does! thanks! .-= Peter´s last blog ..Why Shouldn’t You Add Your Kid’s Income Onto Your Tax Return? =-.